Guys, are you making use of the huge array of websites geared towards you? The ease of making a website nowadays means everyone is online, and many are sharing their ideas when it comes to fashion, sports, food, travel, and more. So you don’t have to wade through the riff raff of a Google search, we pulled our 6 favorite men’s websites. These are top-notch sites that will help you learn to be a better man. Art of Manliness is probably the most popular men’s site online besides the major magazines. They do a great job combining modern tips and ideas with history. They teach everything from making a tourniquet to fashion. They have their own style when it comes to graphics, which you’ll be able to notice after reading just a few articles. Kyle Boureston created Mantelligence because he was sick of the boring content online for men (we know what you mean Kyle). The content on Mantelligence follows 3 rules: easy to understand, actionable, in-depth. We reference Real Men Real Style a lot here on the blog. That’s because their site covers everything fashion and grooming related, as well as communication skills, and travel & living. They create popular infographics to help illustrate many concepts that get shared hundreds and thousands of times. Learn how to make awesome stuff! The first thing we noticed was a wooden bottle opener tutorial. Guys, if you like Pinterest but you’re a bit ashamed to admit it, then Dudepins is for you. This site is Pinterest but for guys. Food, fashion, DIY, fitness, cars, etc. Primer is an online magazine/blog that styles itself as a guide to helping guys grow up after college. There are topis like love, train, invest, learn, spend, earn, and live. The site has great content and is very well put together. At Joseph Wendt Custom Clothiers, we believe that it is essential that your clothes fit you perfectly. 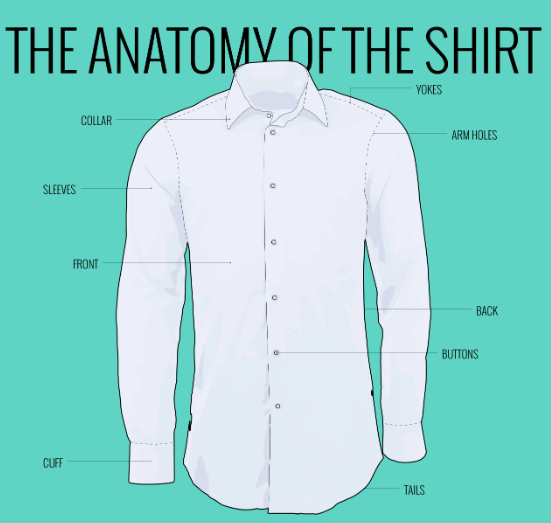 This shirt guide from Neat Blog gives tips on how to pick the right dress shirt for your body. THE YOKES: the entire shirt hangs from here, so if it doesn’t fit right here, you’re in trouble! THE COLLAR: collar shape should be proportional to the tie you intend to wear and the size of the lapels on your jacket: have a productive discussion about this whilst being measured. to check if it fits, you should be able to a) breathe without your eyes feeling like they are going to pop-out of your head, and b) fit three fingers under your collar at the side of your neck. THE ARMHOLES: big enough to fit your manly arms: ensure that they’re not too high so as to bunch and create discomfort under your arms. SLEEVES: it’s cool for exactly one time, but make sure your sleeves don’t rip when you flex. You want the shirt to be tight enough to look good, and loose enough to allow for movement. Ensure that your sleeves are long enough to show at the end of your suit jacket (which means you should probably have the jacket you’ll be wearing when getting fitted), but not so long that your shirt bunches and makes you look like a French revolutionist. THE FRONT: unless you have a large stomach, the front should be close-fitting and flat. You should be able to breathe and stretch without the risk of your buttons popping-off. THE BACK: for a slim-fitting shirt, have your shirt made with a centre-pleat or darts (both of which can be adjusted for a looser fit or a slimmer profile. A baggy shirt looks floofy and horrible and makes you look like an upside-down pear. THE CUFF: generally, the cuff should end four and a half inches from the end of your thumb. Cuff lining can add flair and structure to your cuff. If you wear cuff-links, bring them to your fitting. TAILS: your shirt should be long enough so as to NEVER pop out of your waistband unintentionally. Take advice from those who know what they’re doing on the appropriate length. 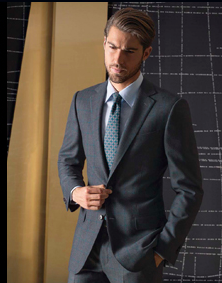 The best choices for business suits in climates like Florida are made of breathable fabrics such as tropical wools and wool/mohair blends that are 120-gauge thread count. These suits wear well, are lightweight and keep their shape. Luxurious Italian cotton and linen suits also are great for staying cool but may require pressing from time to time. For the evenings, opt for a sport coat made of lightweight wool or a silk-linen blend. These fabrics have a light/lofty feel with a beautiful textured look that is great in either solids or patterns. Another ultra-lightweight option would be a cashmere and silk-blend sport jacket. These jackets wear well and are very comfortable. A lightweight shoe can make a big difference in keeping you cool and comfortable in tropical climates. Footwear made of Italian calfskin leather is the best choice. The construction of these shoes is lighter in weight and features either a terry cloth or ultra thin lining. In some instances, you can even purchase a shoe with no lining. Also, the structure of these shoes is soft and breathable and is available in a variety of styles, including wingtip, loafer, monk strap and cap toe. Let’s hear what figures in history have to say about menswear. Here are some of our favorite quotes. Our beloved football season is almost here again, and what better way to celebrate than with a quick look at the minor “fashion” changes in the league this year. Namely, the new uniforms three teams have adopted. Let’s dive right in! Very nice. Very, very nice. The Vikings have fully embraced their true purple color scheme now, eliminating the white and yellow highlights nearly across the board, and brightening the purple to a much more vibrant shade. The leg stripes are gone altogether, while the sleeve stripes have been greatly minimized. There’s also some minor, nifty altered touches to the fonts on the uniforms, too. The logo was only slightly changed, with the viking’s hair braids a bit looser, his horns a bit more curved. Don’t mess with a classic! This is a pitch perfect modernization of an otherwise set-in-stone, and classic look. Perfect. Less perfect, but still pretty good. The colors appear to have been made more vibrant, just like the Vikings upgrade, and the fonts have been made more futuristic. The orange in the uniforms has all but disappeared, relegated to only minor touches here and there. 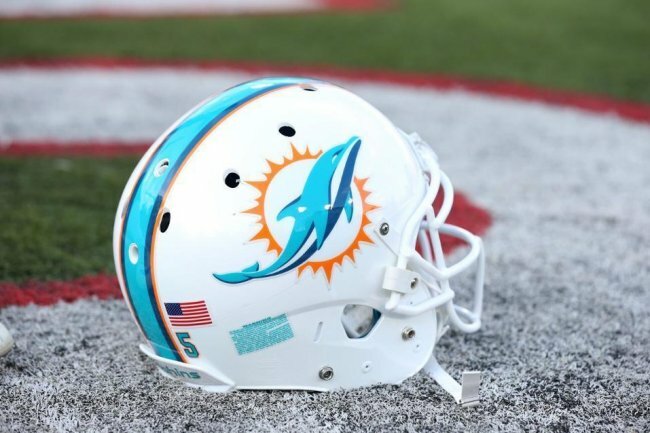 The logo, on the other hand, has undergone a complete makeover, with the old dolphin, which had barely changed since the team’s inception, replaced with an entirely new one. It’s in a different position than the old, and instead of leaning down, as if jumping through something, is now pointed upwards, soaring into a jump. We’re not sure about it, it’s a bit bland, and the old logo, though it was kind of silly, was honestly lovable. …Oh. Oh, dear. Well, points for trying something new, at least. This one is a nearly complete overhaul, and virtually eliminates the teal in the uniform in favor of black and more black. 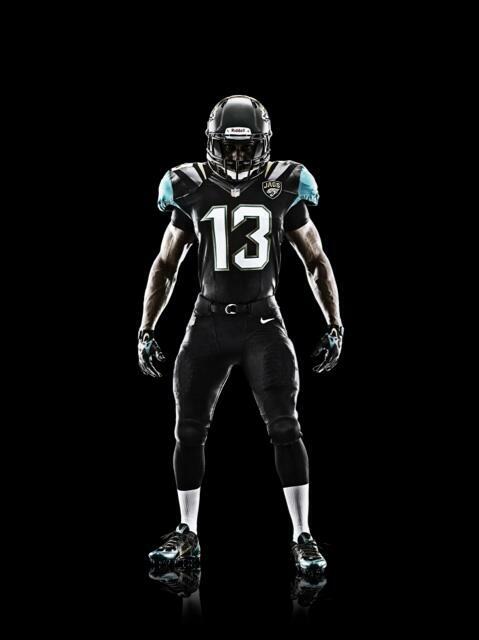 Do we really need another all-black uniform in the league? But the minor details are a bit bonkers. It looks like they’re trying to attract the middle school set… Circa 1993. Everything is XTREEEEM (if you were a kid in the late ’80s/early ’90s, you will instantly know what we mean)! 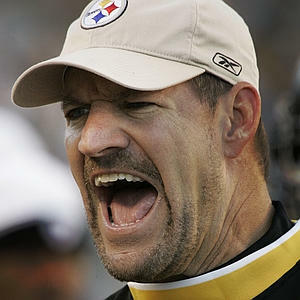 The spikes on the fonts, and the stripes on the shoulders look more at home on a supervillan than a football team. And what’s with the sleeves being different colors? We are not fans. Agh! What? The logo has been updated a bit, with slightly altered, more rounded and realistic features on the Jaguar head: this we like. 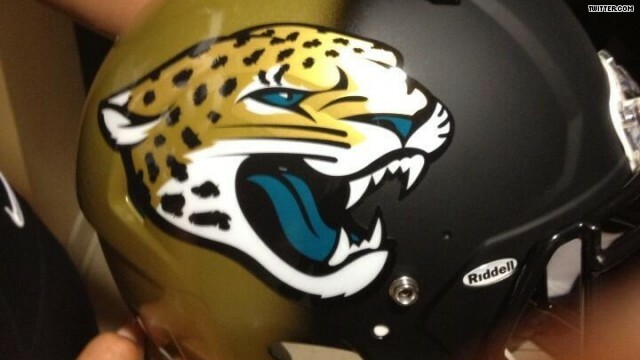 But a two-tone helmet? It’s unique, we’ll give them that, but it looks a little too much like a college team, to be honest. They could look truly awful in bright Florida sunshine. In case it isn’t obvious from our blog and our Facebook page, we’re kind of big on football here at Joseph’s. And this is the time of year when we’re most excited about it: just as the preseason starts! Preseason means football on television again for the first time in months! It also means that in just a few weeks, those wonderful, cozy Sundays spent in front of the TV with friends and family watching America’s favorite game will be here again. What does any of this have to do with us, custom suit designers? Well, for one thing, a lot of our customers are NFL players and people associated with the League. Which is a big reason football season is so exciting for us, especially based, as we are, in the hometown of the defending Super Bowl Champions! But another fantastic pastime is returning along with the football season: the pre-game shows and their commentators, who are always, ALWAYS decked out in top-of-the-line suits and accessories. If we’ve said it once, we’ve said it a thousand times: just because a suit cost a lot or was made by a great company doesn’t automatically mean it looks good or that you’re wearing it right! With that in mind, let’s take a look at the “big three” NFL pre-game broadcasts and their lineup of sartorially-minded sportscasters. 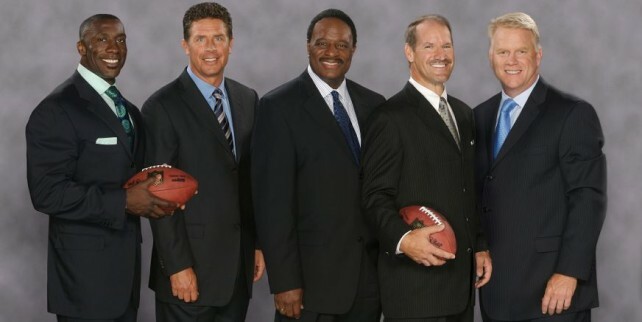 Left to right: Sharpe, Marino, Brown, Cowher, Esiason. Nice, all of them, but a little “run-of-the-mill broadcaster” in some cases. Esiason and Brown could pass for Senators. Marino spices it up a little with unusual ties. 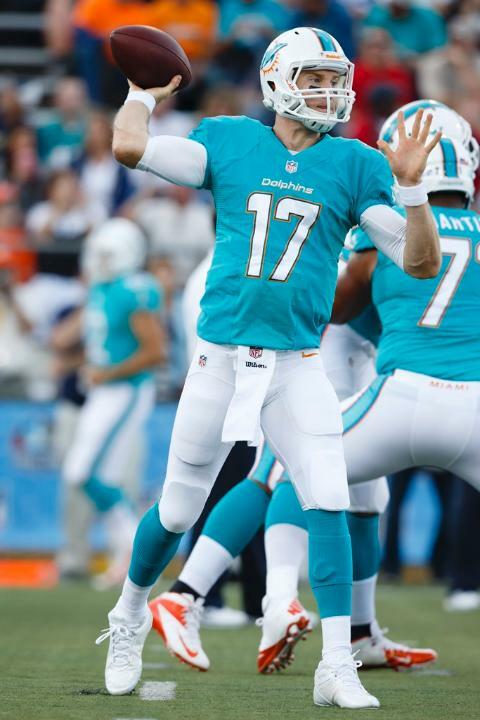 This works sometimes, like in this picture, where the seemingly mismatched colors work with the pale blue undershirt. Other times, not so much. It’s very easy to overuse pinstripes and end up looking like a ’20s gangster. 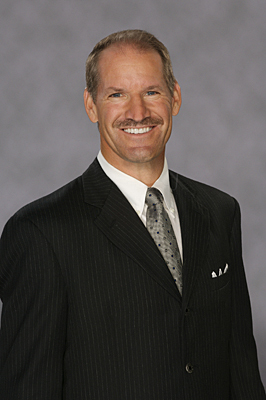 Cowher never does this, and always wears pale, subtle pinstripes, that accentuate his fit form, and make him look quite dashing. But the winner on CBS? He wears pink ties and pocket squares without a care in the world. 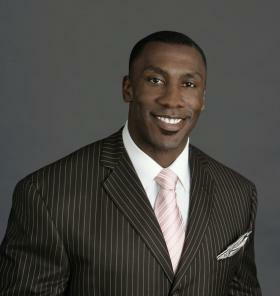 Shannon Sharpe take elements that would look garish and over-the-top on many people, and makes them WORK. Mostly because he carries himself with a comfortable, happy, easy confidence. If he felt awkward, he’d look awkward. As is, he just looks classically flashy and suave. And pocket squares can make an outfit all on their own, but only if they’re used right. Sharpe uses them right, picking the right suits to add them to, and the right colors of squares to add. Just look at this guy! He KNOWS he looks good. We cannot stress this enough, all the money and tailoring in the world doesn’t mean anything if you don’t have the confidence and swagger to make it a part of you, like a second skin. Sharpe does this in spades. Left to right: Menefee, Bradshaw, Long, Strahan, Glazer, Johnson. But they dress a lot flashier than their opposite numbers at CBS. Colorful ties abound, as does a spectrum of suit colors, through blacks, blues, greys and even a touch of violet. 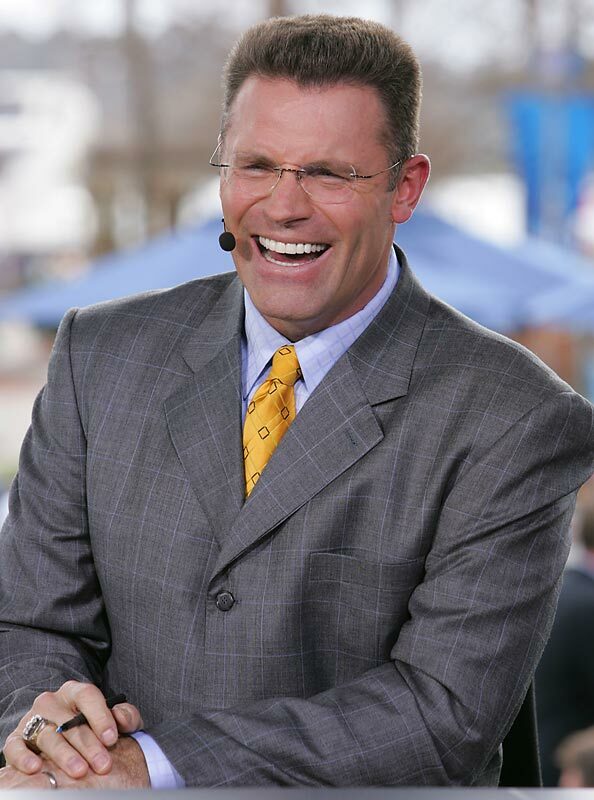 Some with pinstripes, some without, some with pocket squares, some without… The experimentation looks great on the very, very tall Howie Long, who towers over everyone but Michael Strahan. 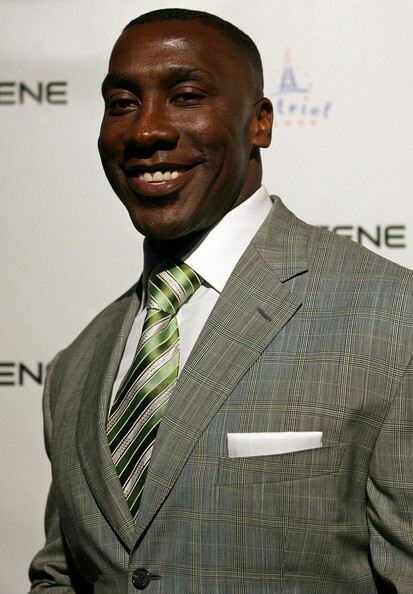 A three-piece black suit with a pale violet pocket square and tie? Up-scale flashiness. Nice. But the crew cut isn’t doing him any favors. 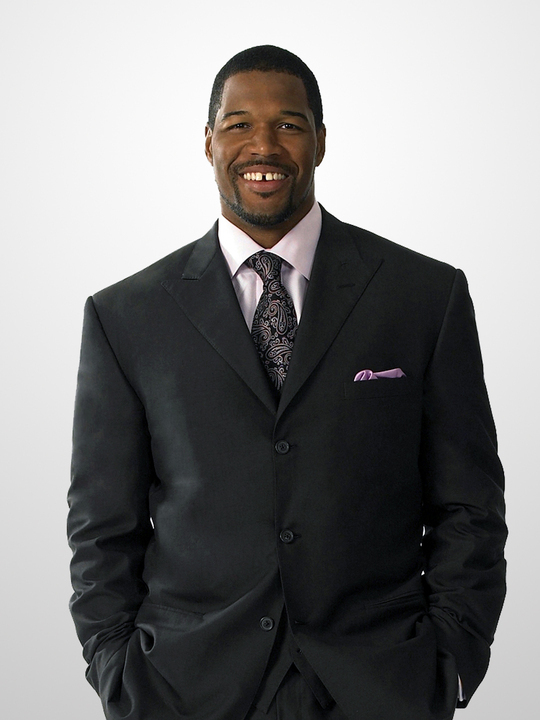 Strahan has the same kind of comfortableness with color and style experimenting. They both work, really, so it’s a tie here. All bow before The Gap. Gotta love the hatched lines in the fabric. Ah, NBC. Poor NBC. It’s getting torn a new one for its Olympic coverage right now, and the golden days of Must See TV are long gone. But say what you will about the occasionally awkward Faith Hill intro sequence, NBC Sunday Night Football is probably the slickest sports production on TV right now, and the pre-game show is no exception. 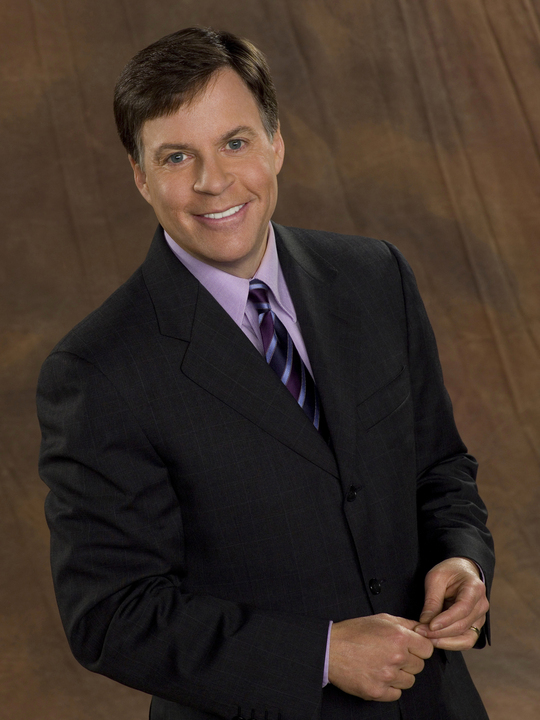 Headlined by Bob Costas, the analyst team is an unusual mix of sportscasters, former players and coaches of extremely varied ages and styles. C’mon, he’s been the voice of the Olympics for 20 years, Costas deserves his own picture! 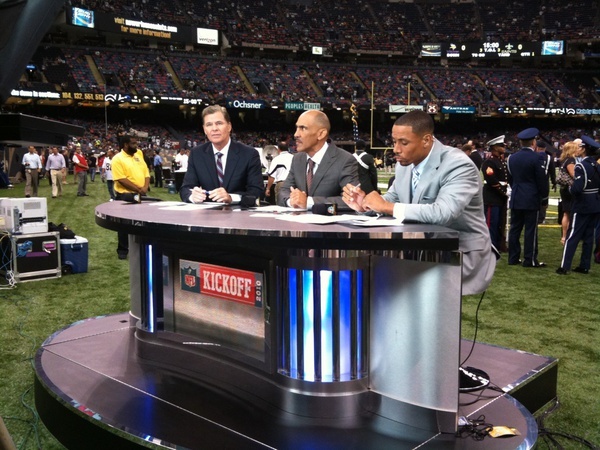 Left to Right: Patrick, Dungy, Harrison. Really, all of them do it well. Costas, despite his small frame, always wears great color combos and well-tailored suits for his build. Rodney Harrison has a lot of fun with his suits, bounding between traditional and blindingly unusual from week-to-week, and Tony Dungy and Dan Patrick are always sartorially solid, dressed perfectly every week. So who wins this round? The guy who isn’t there yet. 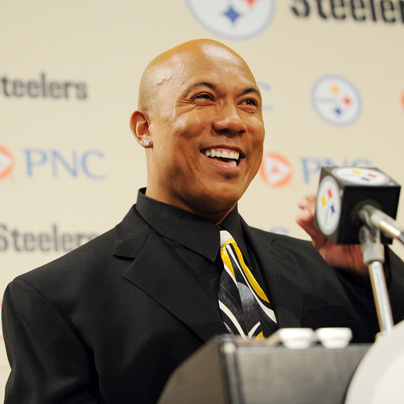 Hines Ward will be joining Football Night in America this season, and a quick look at some of the more fantastic suits he’s worn over the years tells us he’ll be bringing a Sharpe-like fun and confident tone to the show. Just leave the dance moves at home, Hines.